The inconvenient truth is that, while saving energy on your Mac by automatically dimming its screen or even sleeping the CPU is good and all, it can sometimes be a pain in the neck. When you’re giving a presentation, for example. Or when you’re watching a gripping YouTube video and the screen goes dark because you haven’t touched your mouse in half an hour. It’s a problem that several Mac utilities attempt to solve, most notably Caffeine. But none of them go to the same lengths in that quest as Should I Sleep. As you know, you can go to the Energy Saver preference pane and specify times after which you want your display and/or CPU to go to sleep. (That’s obviously of importance primarily when you’re running a laptop on a battery.) Caffeine and others of its ilk temporarily suspend those settings, so your screen won’t go black before that movie you’re watching is done. 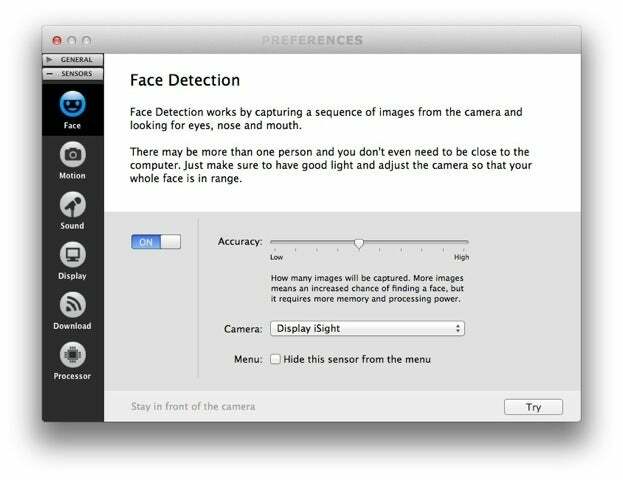 You can adjust the sensitivity of Should I Sleep's Face Detection. But those utilities aren’t particularly intelligent: For the most part, they’re on or off. At least one (Wimoweh) allows to specify sleep behavior by app (never sleep when Keynote is running, for example). But Should I Sleep goes way beyond that. The face-detection sensor uses the camera built into your display to look for a face—in other words, it checks to see if you’re sitting in front of your computer. In my testing, it worked perfectly. You can increase its accuracy setting in Should I Sleep’s preferences (if it doesn’t detect your face even though you’re staring at the camera); doing so increases the number of images the camera will capture looking for your face. That’ll make the app more accurate, but will also consume more system resources. Camera motion: Captures a short bit of video using your display’s camera and then checks for differences in the resulting frames; it prevents sleep if it detects any. In my testing, I found this sensor very sensitive, but again you can adjust that (so you aren’t suspending sleep whenever a bird flies by your window). Sound activity: Using the default microphone, captures audio samples, measures the average volume, and prevents sleep if it hears something. Once again, you can adjust its sensitivity. External display: This one’s particularly good for presenters. It prevents sleep whenever it detects that an external display or projector is plugged into your Mac. Download monitor: Prevents sleep based on network traffic—downloads or uploads. For this sensor, you have the option of allowing the monitor to dim even if the computer is kept awake. Processor usage: Keeps your Mac awake if it’s working hard while unattended (think processing audio or video files). Just typing won’t trigger it. 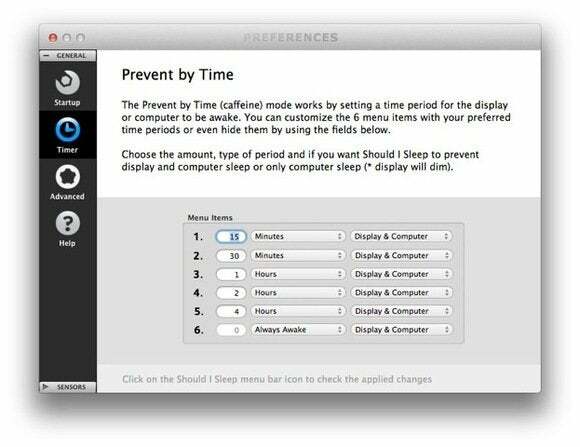 Set different time intervals for you Mac to sleep. In addition to using the sensors, you can also use Should I Sleep in simple Timer mode, which is how Caffeine and most other utilities of this ilk work. You can choose from six time durations during which you just want the display and/or computer to stay awake. By default, you can opt for 15, 30, 60, 120, or 240 minutes, and Always Awake, but you can customize those six options to whatever durations you want. You can select the sensors or the times you want from the app’s menu bar drop-down. All of Should I Sleep’s sensors worked as advertised in my testing. That testing was made much simpler by the app’s clear, concise onscreen instructions. It tells you exactly how to test to be sure a given sensor is or isn’t working. The interface generally is really well done—simple and direct. One other nice touch: You can enable the app to use notifications, so it’ll tell you when it has suspended your sleep settings. If you're using streaming media, Should I Sleep can prevent your Mac from going dark. You can find similar apps for free, but given how powerful and customizable Should I Sleep is, I think it’s worth the money to get the sensors that make it a much subtler tool than those others. If you ever want your Mac to stay awake, for whatever reason, Should I Sleep is the best tool I’ve found for that job. Filled with features and customization options, Should I Sleep is a valuable Mac utility.